Welcome to another edition of Channel Chaser! I know that I have noticed–and I’ll bet you probably have, too–that most of the shows I review and talk about in this column are usually fantasy or sci-fi related. I apologize for this obvious bias, but these are just the kind of shows that I happen to like and watch the most. Today, however, I’ll get going a little bit outside the mold and talking about (cue gasps) a procedural cop series. But it’s not just any crime drama: it’s the long-running FOX show Bones. As the title would suggest, Bones is primarily focused on the efforts of a team of forensic anthropologists and other scientists at the fictional Jeffersonian Institute in Washington, D.C., who study human remains. For various reasons, this group of people, headed by the highly intelligent but emotionally distant and socially awkward Dr. Temperance Brennan, gets drawn into assisting the FBI with various criminal cases–most often through the medium of Agent Seeley Booth. Booth serves as the show’s everyman, often putting the techno-babble and lab jargon into more understandable terms for the audience, and even gives Brennan the nickname “Bones” (see what they did there?) which she at first hates, but eventually comes to accept. I suppose this is a spoiler if you don’t watch the show, but it should not come as a surprise to anyone that Brennan and Booth are romantically interested in each other and eventually end up getting married in the show’s ninth season–although the writers sure took their sweet time getting there. While it is a bit clichéd, the relationship doesn’t come off nearly as cheesy as it could have due to all the emotional turmoil that Booth and Brennan undergo over the course of time, and the fact that they compliment each other very well, with Booth humanizing Brennan more and Brennan tempering Booth’s superstition and rash decisions with calm logic. I should also take the opportunity to say that Booth and Brennan are also very interesting and well-grounded characters with good back-stories. Brennan is eager to get into crime fighting because of her mother’s disappearance when she was a child, and Booth acts tough to cover up the post-traumatic stress he suffers from his tours in the military. Emily Deschanel and David Boreanaz do an excellent job of portraying these two complex people. In fact, one of the things I like most about Bones is the large ensemble cast, filled with extremely different people who all seem to love working together, from boyish psychiatrist Lance Sweets to the prankster scientist Jack Hodgins and sophisticated artist Angela Montenegro. The supporting cast is really quite strong, and the interplay between all these different personalities brings out what I really love in the show: the fact that it doesn’t take itself too seriously. This is the main drawback with most of the cop shows I’ve seen like CSI and all those other abbreviated titles. While it definitely has moments of distress and darkness, Bones is overall quite a light-hearted entry in the crime genre. As an additional fun side note, I never cease to be amused by the meta-humor the series plays with as well. Bones is actually based on the writings of author and anthropologist Kathy Reichs, who serves as the show’s producer. Her books feature a main character named Temperance Brennan who solves murders, and this was given a nod in the show at large, as Brennan is known for writing novels about her own fictional scientist named Kathy Reichs. 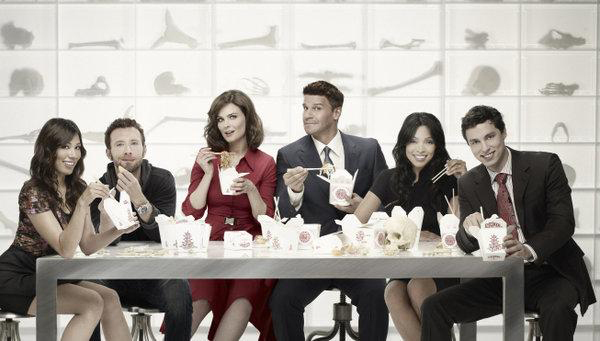 My biggest complaint about Bones is that it falls into what I see as the same trap that pretty much ever cop show does to some extent–that of becoming drier, more predictable, and less original as the series progresses. The situations do start to get a bit more see-through every time you watch it, but I have been relatively pleased to see it branching out more in its later life, pursuing stories that are more dramatic and less to do with just poking at old bones–such as Booth being framed for murder in a recent season ten episode. That said, a show that can still entertain me and make me laugh after ten years on the air has to be doing something right. Bones also tries to spice things up by introducing larger story arcs over several seasons that transcend the standard “Oh, look, we found some bones. Let’s catch a killer” mindset of the series. These include renegade sniper Jacob Brodsky and an assortment of serial killers–one of whom takes on one of the main cast as an apprentice. But there’s no way I’m spoiling that one for you. In Bones, I’m actually reminded quite a bit of Castle, another crime show that I happen to like and watch frequently. The only real difference, other than slightly differing professions between the shows, is that one reverses the gender roles of the other. Bones features a humanistic male protagonist with an odd and eccentric female lead, and Castle goes in the opposite way by pairing a female cop with a male writer and millionaire. It’s not a perfect metaphor, but the point is that if you like one, you’ll probably like the other. The only reason I didn’t score Bones higher is because it is a cop show by and large, part of one of my least favorite genres on TV. This should not dissuade you from watching it, however: in its field, Bones is definitely one of the freshest and most entertaining entries that I’ve seen in some time. I’m interested to see how the show can progress now that the romantic tension between Booth and Brennan has mostly been resolved, but if its long and successful run is any indication, Bones will probably be around for years yet to come.